Dulce de Leche is Spanish for candy made of milk or caramel. 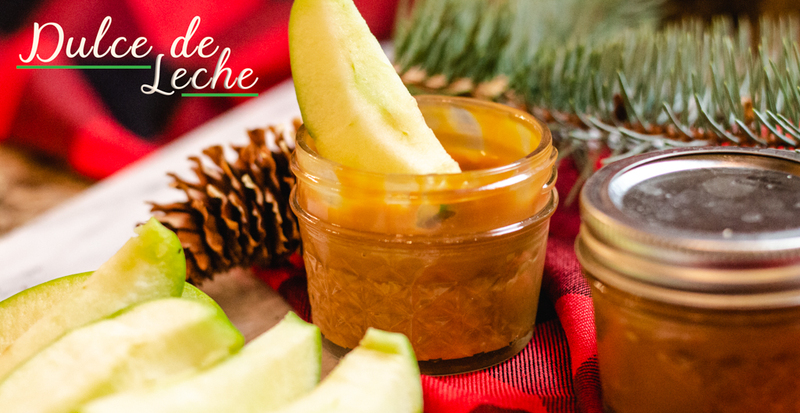 Making Dulce de Leche is very easy and fun to make. Dip apples, fruits, cookies or anything you like into this wonderful caramel sauce. 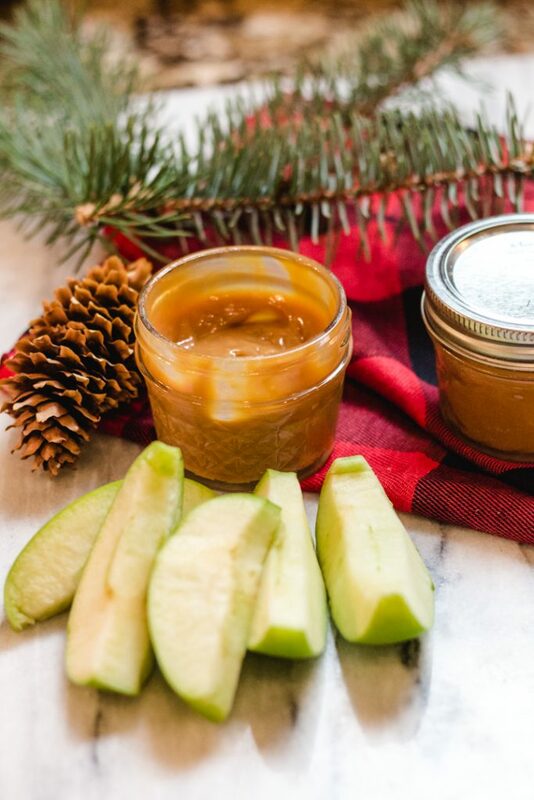 I adore caramel apples, so for me dipping apples into Dulce de Leche is over the top delicious! But Dulce de Leche is also good on Ice Cream, Pies, cookies and so much more. 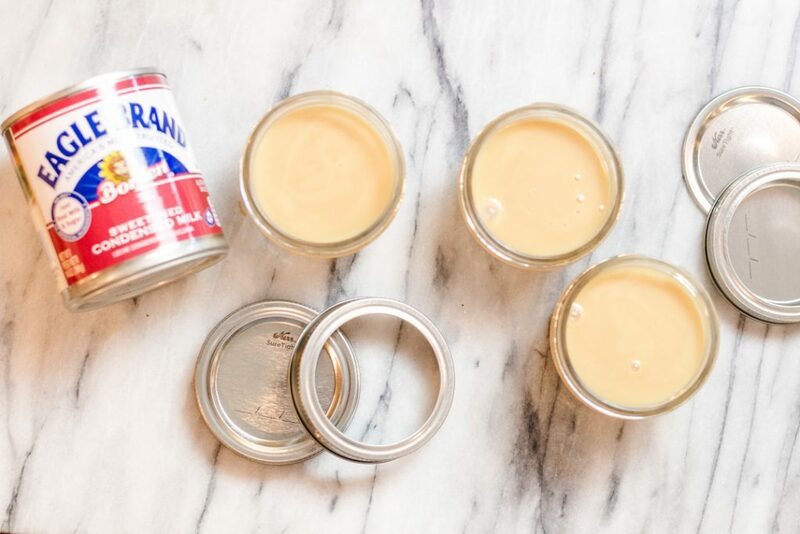 This sweetened milk turns into smooth beautiful caramel under pressure and is a perfect treat to share. 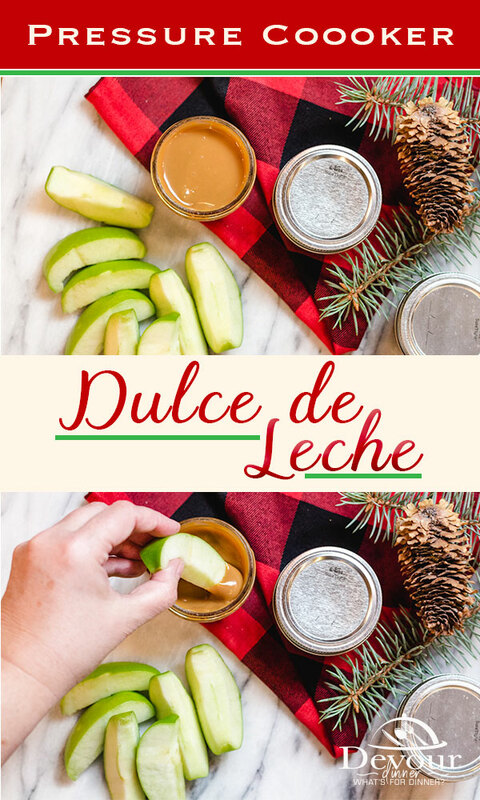 My husband for a time lived in Chile years ago where he was introduced to Dulce de Leche and he quickly fell in love with the rich caramel sauce made from sweetened milk. Through the years I’ve always been looking for a recipe that was easy to make and delicious. I found it! This recipe couldn’t be easier. 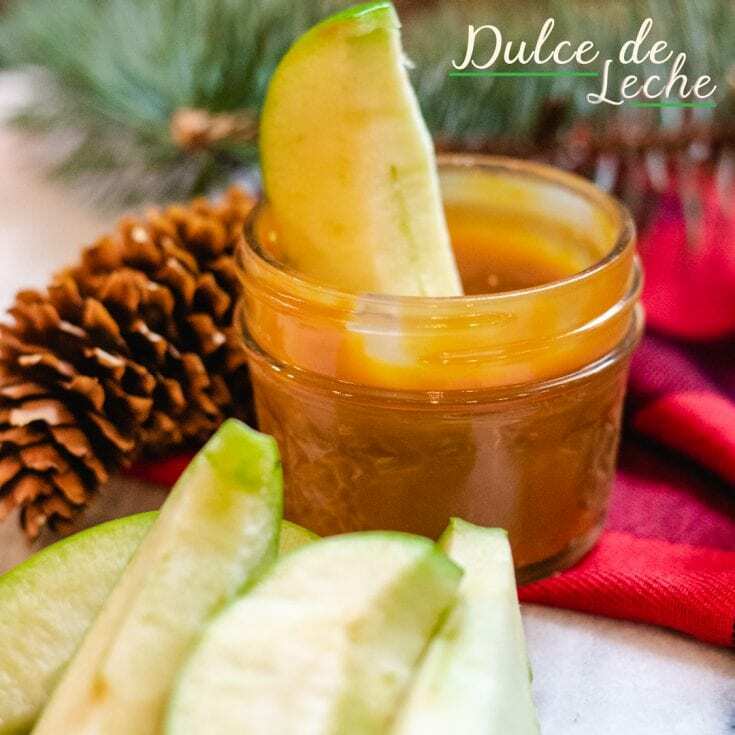 Dulce de Leche is a Spanish for “candy made of milk” or essentially a rich caramel sauce. And let me tell you. If you haven’t tried it, it’s wonderful on so many things from Ice Cream, to cookies, cakes, and fruit. The list is endless. When making Dulce de Leche, keep in mind there are a couple of ways to make this amazing caramel sauce. You can use mason jars that are approved for pressure cooking or you can make this right in the can. Just don’t forget to remove the label first! Timing is important. Everyone likes their caramel a little thicker, richer and darker than another so you will want to play with this recipe a little bit to find your sweet spot. Also, when you first open the lid on the can or the jar, the caramel may look a little cuddled. Don’t worry. This is normal. Just give it a quick stir and it will smooth out nicely. Looking for a quick and easy Neighbor Gift, Teacher Gift, or something to take to a party? This recipe is it! 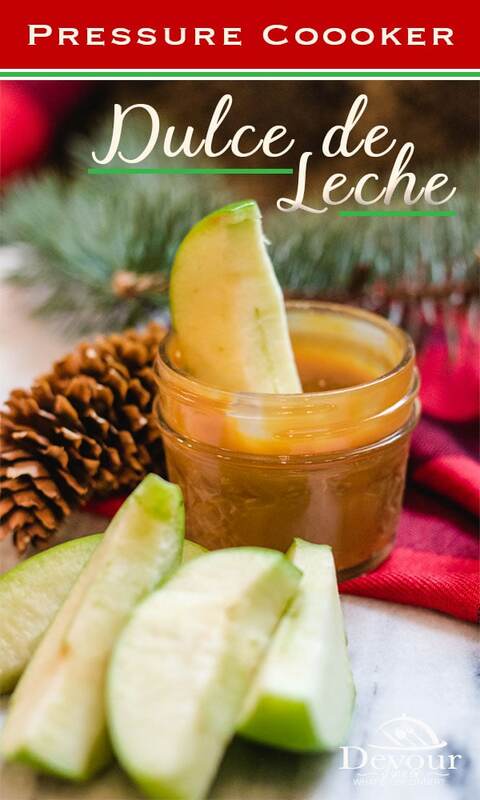 Take a look at how cute this Dulce de Leche is with an apple. It’s Perfect for your holiday gift giving needs. Dulce de Leche is a rich caramel. Depending on how long you process will make a darker and richer flavor. It’s a recipe to test and decide what you like best. We like a 35 minute processing time for a mid level darkness and a rich flavor. But WAIT! 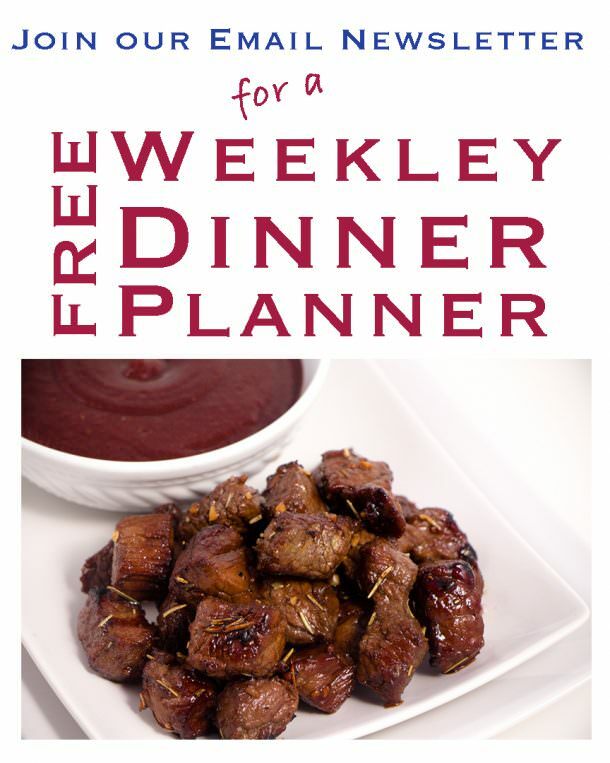 We’ve got MORE Amazing Recipes to try! Dulce de Leche is a sweeten milk that tastes a lot like caramel. Dulce de Leche is Spanish for candy made of milk or caramel. Enough water to fill to 1/2 inch of top of 4oz mason jars. Place clean lids and on jars and screw finger tight, not too tight. Place 3 4oz mason jars on trivet in Instant Pot and fill pot with water to just below rings of mason jars. Set to Manual for 35 minutes and allow to fully natural release. Remove jars from Pressure Cooker and allow to sit on counter until cool. Caramel should be kept in refrigerator to keep. 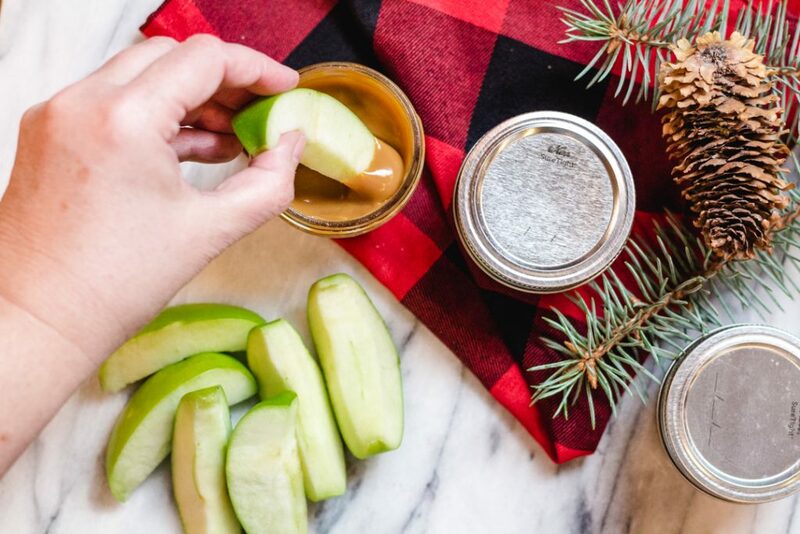 Serve with apples, fruit, cookies or anything else you wish to dip into creamy caramel. Take paper label off sweetened condensed milk can. Place can on trivet into Pressure Cooker and fill pot with water. Allow 1/2 inch of can to be above waterline. Set to Manual for 35-45 minutes. The longer you process the darker and richer the flavor. Allow a full natural release. 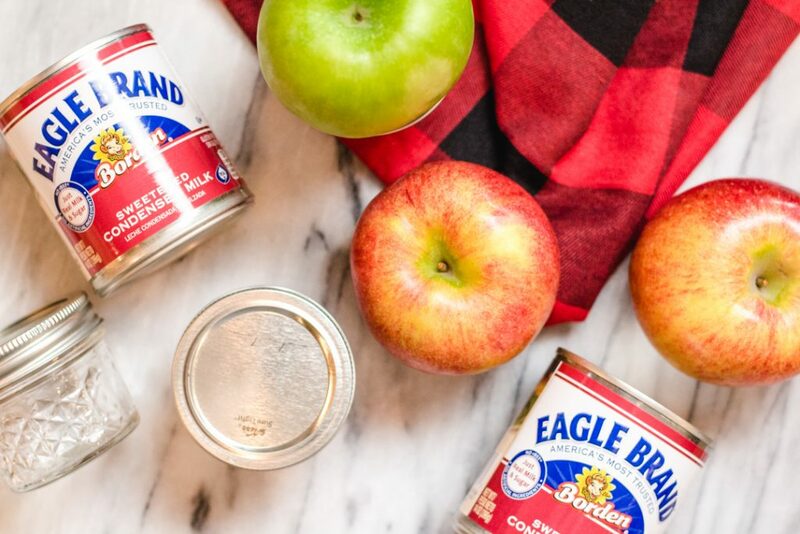 Remove can from Instant Pot and allow to sit on counter for 30-45 minutes. Open Can and remove lid. Pour Caramel into bowl or jar. You will need to stir caramel. Consistency can look somewhat curdled. Stirring after processing brings the caramel back to a smooth consistency. Store caramel in Refrigerator to keep. I like to process 4oz mason jars for 35 minutes with a full natural release. However, when I process a 12oz can, I like to process 45 minutes to achieve the same dark richness. It's a personal preference and something you will have to decide for yourself. Do you know if jars can be sterilized in IP or alternative method? I do not have a dishwasher. 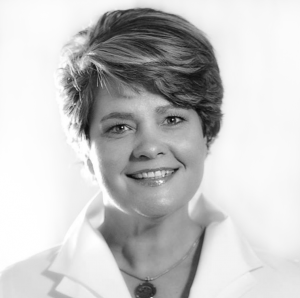 Hi Christine, Canning Jars can be sterilized a number of ways. You can use a large stock pot and place clean jars into the stock pot, fill with water to above the jars and boil for 10 minutes. Allow to cool and remove jars (they will be hot). There are also other resources on line for other methods as well! I can’t wait to try this. Do you sterilize your mason jars in the instant pot before using them? If so, how do you do that?